To roast and char the lemon, heat the BBQ grill to medium-hot. Zest ¼ of the lemon and set aside for later use. Place the lemon on the BBQ and cook until charred and soft. Set aside. Coat the aubergines in the grape seed oil and season well. Place the aubergines on the grill and cook until the skin has charred black and the aubergines have softened and collapsed on themselves, turning every few minutes. Remove from the grill and rest for 10 minutes before cutting half and spooning out the cooked flesh into a bowl. Use a fork to crush the flesh to a puree, discarding any firm pieces. Add the lemon zest, one tablespoon of the charred lemon juice, the tahini, sesame oil and olive oil. Mix well to combine. Season to taste and set on the side of the BBQ to keep warm. For the za’atar, start by toasting the sesame seeds in a hot, dry pan until golden. Add the harissa, sumac and smoked paprika and remove the pan from the heat. Once cooled, add the smoked salt and dry herbs. 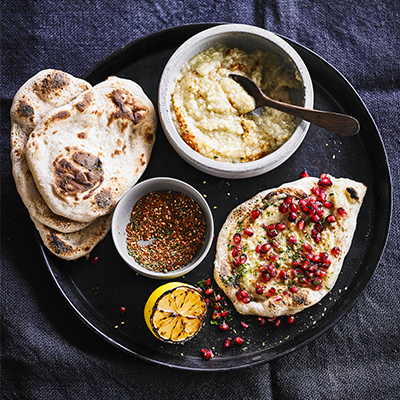 To finish, spread baba ganoush over each of the warm flat breads. Sprinkle with the za’atar. Finely chop and generously scatter over the parsley and pomegranate seeds. Squeeze over any remaining charred lemon juice. Combine the yeast with one tablespoon lukewarm water and set aside for 5 minutes. Combine the flour, yogurt, egg, yeast mixture and milk in a mixer bowl and mix using a dough hook for 3 minutes on low speed until a homogenous dough is formed. Rest for 10 minutes, then add the salt and mix for an additional 5 minutes on medium speed until a smooth dough is formed. Portion the dough into 12 even-sized balls and place on an oiled tray. Cover the tray with an oiled sheet of cling film and leave to prove for 2 ½ hours in a warm environment (24-25°C) until the dough has increased by half. In the meantime, preheat the Furnace with a pizza stone and aim for a temperature of 300°C. Using greased hands, gently roll each ball of dough into a round shape approximately 1cm thick. Place on the pizza stone and cook for 3-5 minutes, then flip over and cook for an additional minute.